North Park is an urban neighborhood in San Diego. It is often cited as the “hipster” area of town and is generally known for being one of the more walkable areas in San Diego. North Park is home to the only 2 parklets in San Diego, the majority of the bike corrals in the city, and it is not uncommon to see people biking on the streets. If there is anywhere in San Diego you would expect to find good bicycle infrastructure North Park would be high on the list, perhaps along with East Village, Downtown, Little Italy, or a beach community like Ocean Beach or Pacific Beach. The reality on the ground is far from good. The reality is a near absolute lack of any bicycle infrastructure. 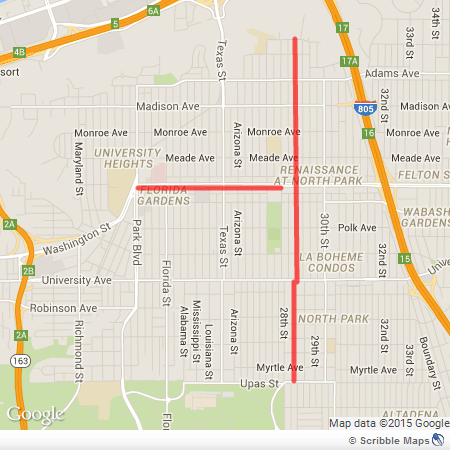 Here’s a complete map of all the bike lanes in North Park, highlighted in red. The gray, white, orange, and red lines indicate all roadways. There are a total of 2 streets in North Park that have painted bike lanes. One of them is a portion of El Cajon Boulevard, with cars regularly exceeding 40 and 50 MPH. 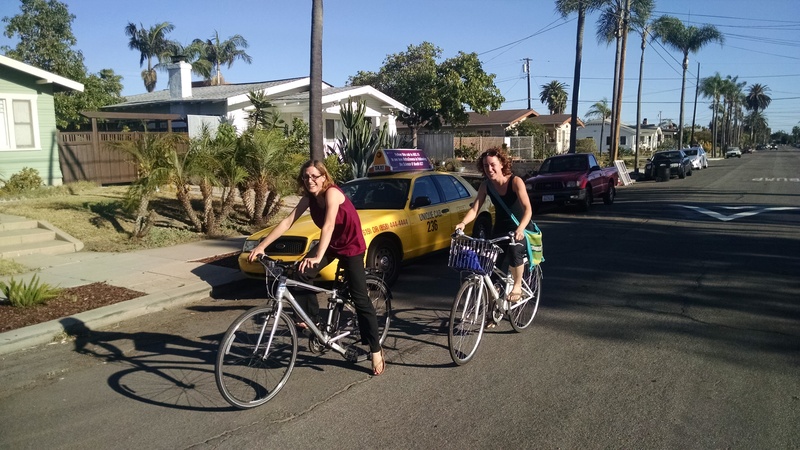 There are no protective measures for biking anywhere in North Park. There is no system or grid to bicycle – if you ride on a roadway with a lane you will be forced to connect to another roadway without any dedicated space for biking whatsoever. San Diego, and particularly North Park, has very wide streets. There is plenty of room on many of the streets to add bike lanes with the minimal cost and effort of applying paint. Paint is not protection, but it is much better than no dedicated space at all. When conflict occurs due to lack of separated space, as on Adams Avenue recently, drivers can literally run over those biking without likelihood of prosecution. If a place like North Park that is promoted as being a good place to bike or walk has so little accommodation for bikes what does that mean for other areas that are more explicitly car-first? If our Climate Action Plan rightly targets transportation as a focus area to create a better future, how do we increase biking by a factor of 18 as the plan seeks without facilities to support that growth? We will not get there without meaningful change on the ground. A couple of bike lanes in a neighborhood of 50,000 people in the core of our city is not good enough. It’s barely even laughable as an attempt at being bike and environmentally friendly. It underlies how unserious we are about moving away from the private automobile as the overwhelming primary transport option. It is no surprise that so few people bike in San Diego when the reality on the ground is unless you are confident and strong enough to bike with zero accommodation on wide, high speed streets you are out of luck. Parents, myself included, fret about biking with their children or letting their kids bike to school. Would you put your child on a bike on University Avenue (where SANDAG just scrapped a plan to add a bike plan) or El Cajon Boulevard? Or even smaller streets like 32nd Street or Arnold Avenue? On a recent speed survey on Arnold “City Engineers determined 85% of the traffic was indeed exceeding our 25 mph speed limit by at least 10 mph – one vehicle was going 71 mph – and that test wasn’t even on a Friday or a weekend!” Quoted portion from North Park Nextdoor website. Perhaps the good news is we can only improve from our current status. That is little comfort for those working and fighting to create a safer, healthier future for our neighborhoods and city. Real support for real improvement is needed from our elected officials and transportation authorities. Foremost we need leadership from SANDAG to pursue a responsible future path on both transportation and land use – not plans that ignore climate change, encourage sprawl, and commit billions and billions to more highways and scraps for biking, walking, and transport. Even the scraps committed to healthier transport are back-loaded and likely to be walked back when push comes to shove. North Park – I dig you. But bicycle friendly you are not. Granada Avenue – 54 feet wide but not an inch for bicycles or crosswalks. Good luck to those that don’t want to drive. Contact the city councilman Todd Gloria or one of the candidates to replace him in 2016 and try to get a commitment from them on paper before the election. I believe Chris Ward is one of the leading candidates to succeed Gloria in your District (3). Good luck! @MattPatterson Well put. Have been working on this and will continue to do so in future - hope you'll do the same! Cheers!